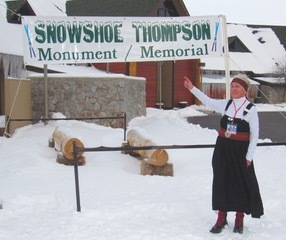 What began in the year 2000 as a means to raise funds to erect a statue of the “Legendary Mailman of the Sierra” eventually became The Friends of Snowshoe Thompson organization, whose purpose today is “To promote and foster the memory of John ‘Snowshoe’ Thompson through events and activities, and to maintain the statue and planter in Mormon Station State Historic Park” here in Genoa. 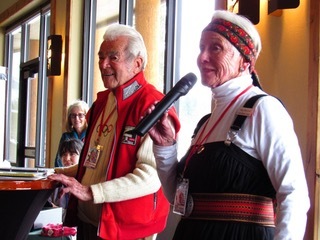 Annually, The Friends of Snowshoe Thompson holds a springtime snowshoe and cross country ski event, and a fall Chautauqua event, both of which are attended by “Snowshoe Thompson” himself. Additionally, every five years the organization holds a summer picnic celebrating the statue, which was dedicated on June 23, 2001. 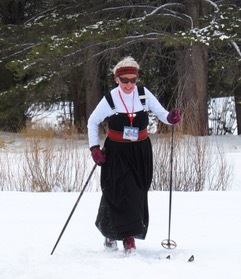 This year on February 24, the organization celebrated its 18th Annual Snowshoe Thompson Ski & Snowshoe Celebration at the Lake Tahoe Golf Course in South Lake Tahoe, CA. The organization partnered for the first time with the Lake Tahoe Historical Society, Alpine County and the Douglas County Historical Society, all of which are located in communities where Snowshoe Thompson had a significant presence. The event was a resounding success with 60 plus attendees, more than in any past year. 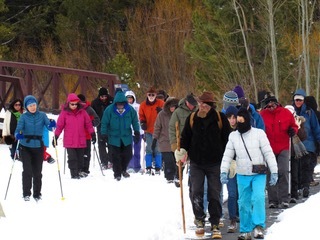 Attendees joined Snowshoe Thompson (portrayed by Steve Hale) on a journey around the snow-covered golf course grounds, and learned about “long-boarding” from member and Norwegian native Nina MacLeod. Musician Richard Blair entertained with his original folk songs, including one about Snowshoe, himself. Author Frank Tortorich was there with his book John A. “Snowshoe” Thompson: Pioneer Mail Carrier of the Sierra. 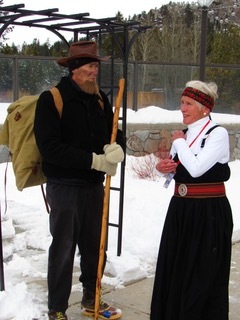 There were also displays and exhibits by the Lake Tahoe Historical Society, as well as The Friends of Snowshoe Thompson. It was a family friendly event where attendees also enjoyed lunch as part of the entrance fee. The date for next year has already been secured, so if you missed this year, you won’t want to miss 2019s event. Mark your calendars for Saturday, March 2, 2019 at the same location. In the near future, The Friends of Snowshoe Thompson will be working with the Snowshoe Thompson Chapter 1827 of E Clampus Vitus, which is a Genoa based organization dedicated to preserving local history. 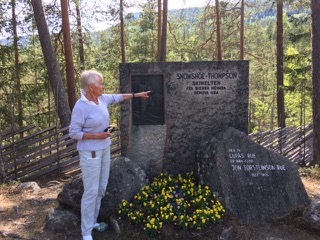 Members of The Friends of Snowshoe Thompson have also recently visited the Sons of Norway Snowshoe Thompson Lodge #6-78 in Yuba City, CA for their 55th Anniversary Celebration, reconnecting with members who attended the statue dedication in 2001. 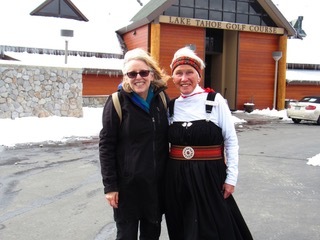 So as you can see, it is a small world and Snowshoe Thompson’s legend extends far and wide beyond Genoa and Carson Valley. If you are interested in becoming a lifetime member for only $10 (yes $10) or for more information about the organization, please check out their website http://snowshoethompson.org/, or their Facebook page: Friends of Snowshoe. You may also contact Secretary, Sue Knight at wildrose@pyramid.net and 775-315-7777, or President, Kim Harris at kim.dabunns@hotmail.com and 775-220-0605.